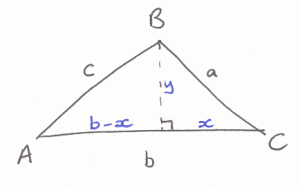 If I tell you two sides of a right-angled triangle, you can easily work out the third using Pythagoras' theorem. 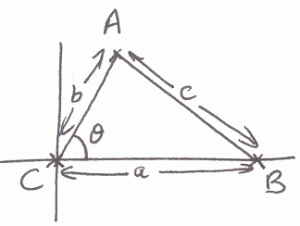 But what if the angle between the two sides is not a right angle? 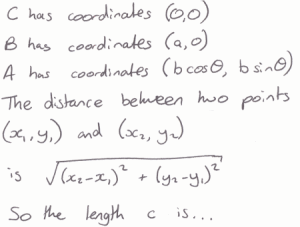 Is there a way to work out the length of the third side? Some students tried to work out a formula to work out the length of the third side when we know two sides and the angle between them. Below, you can see the start of their methods. Can you finish each method to produce a formula? Does each method lead to an equivalent formula? 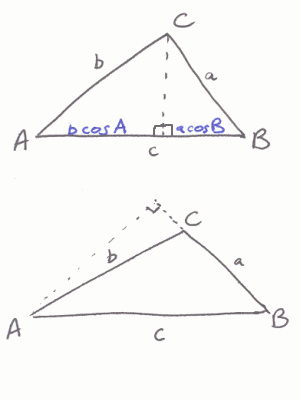 Does each method work for both acute- and obtuse-angled triangles? Triangles. 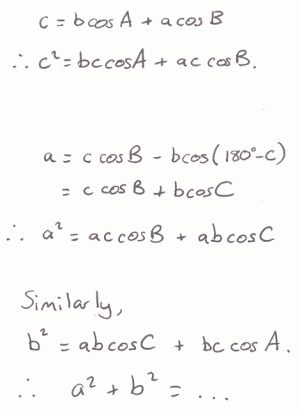 Mathematical reasoning & proof. Number theory. Creating and manipulating expressions and formulae. Generalising. Networks/Graph Theory. Making and proving conjectures. Quadratic equations. Inequalities. 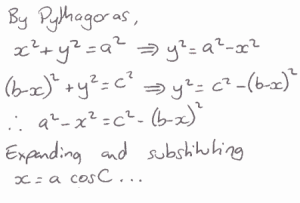 Sine rule & cosine rule.